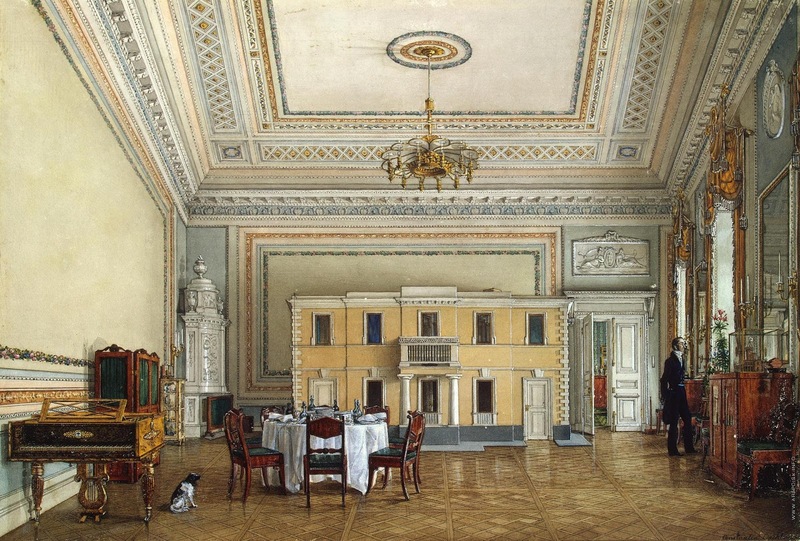 Maria, Olga and Alexandra, the daughters of Nicholas I, had a playroom on the 2nd floor facing in the large inner courtyard of the Winter Palace before the 1837 fire. 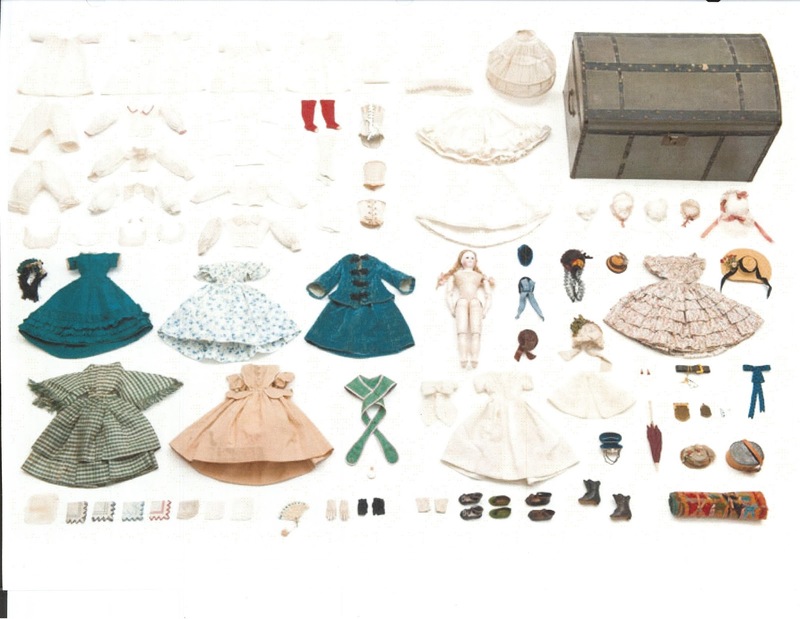 One of their toys was a box containing an incredible array of eighty-seven pieces of historical clothes for a child to dress their doll. Old toys were carefully preserved in the palace storerooms and taken out for future generations to play with. The children of Alexander II were thrilled to learn their beloved shabby horse was once ridden by their grandfather. There are undergarments, chemises, bloomers, corsets, petticoats and stockings. Completing the outfits are dresses, hats, shoes, and gloves. The ensemble includes handkerchiefs, purses, a fan and an umbrella. There is also a picnic blanket and hamper. Thank you very much. I am enchanted with the wardrobe! Opinions will vary as documentation is missing. Clues are the hats with the long tailing ribbons and the black/white checkered coat dress, a holdover from the turn of the decade in 1830. These are reminiscent of the late 1830s-early 1840s, the beginnings of the Victoriana period of dress. It is a doll’s wardrobe for older girls, Olga 13 yrs and Adina 10 in 1835. 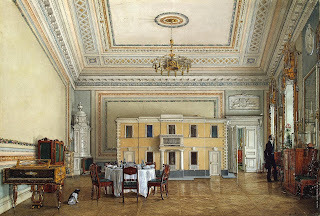 In 1855 after ascending the throne, Alexander II and his brothers and sisters went through the palace storerooms and distributed their childhood things. 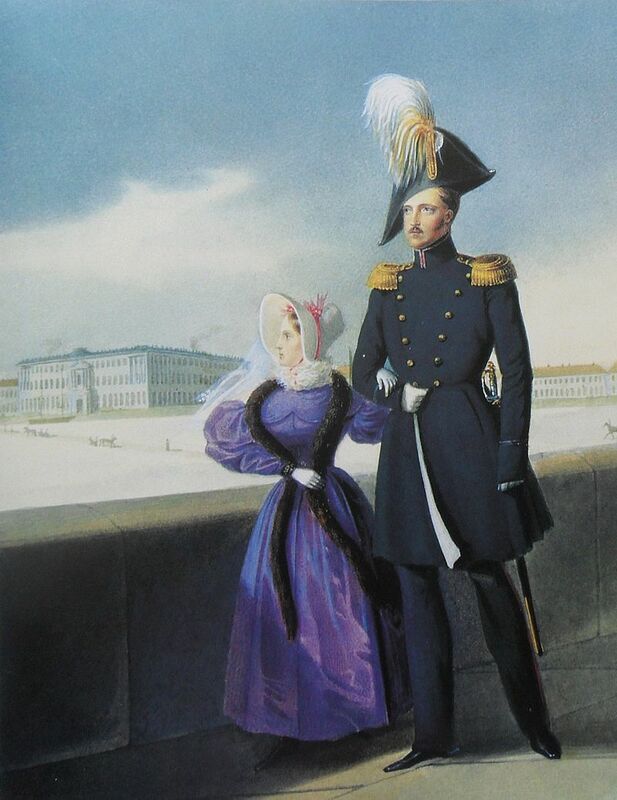 Possibilities of its preservation - With Adina’s death and Olga having no children, Alexander may have taken the box for his daughter Maria yet I would have thought Maria would want her toys for her daughters. Or another sibling and it passed down the family. I have a partial inventory of children’s things in 1855 but box is not listed nor the dollhouse Nicholas gave his granddaughter Alexandra that was stored after her death in 1849. I'd argue that, in addition to the shape of the sleeves, the hats, as you say, are the best indicator of time frame, here. Several of them are in the "calèche" shape with ribbons/lace hanging down the back, which sat back from the face, and which would be current in the 1850s-60s. None of them are the "poke bonnets" of the 40s or the wide, plate-like hats of the 30's. The only broad-brimmed hat is the straw one at far right - which is just like the one worn by the Empress Eugénie in Winterhalter's 1857 "chapeau de paille" portrait that is now at the Hillwood estate. Also, in Winterhalter's group of the Empress and her ladies, the marquise de Latour-Maubourg carries the same sort of straw hat. Another clue is the footwear. Ladies were still wearing slippers with ribbon ties in the 30s and 40s, only rarely adding gaiters when absolutely necessary. Those shown here are all solid shoes with one very noticeable pair of boots! Lastly - and I don't know why I didn't notice this before - there's a cage crinoline at the very top of the image, next to the trunk. Crinoline - the horsehair fabric - was used for petticoats from the end of the 30s, but the hoop/cage crinoline only appeared in the 50s. Stephilius I want the details you discover - a great help for me. It is fascinating to decipher and something to be aware of when researching. You never know where one pic or paragraph will open doors to further information - a never ending search! I found info on a doll of GD Olga's in 1835 that had twenty dresses. The above wardrobe is difficult without archival documents but the crinoline will narrow the date to the 1850s. The Grand Duchess Marie Alexandrovna is elusive in my research on the Winter Palace. A shame because the view of her childhood by historians was different from her own writings. Looking again at the wardrobe and dealing with pre-fire 1837 Winter Palace, it reminds me of the wide hip crinolines of the 1780s, sideways through a door and forget a chair, a sofa would only do, and the birds' nests in the women's wigs. And the 1850s wide circular crinolines and now the birds' are on the hats! Stephilius, do you have images of crinolines from 1830s to 1860s?